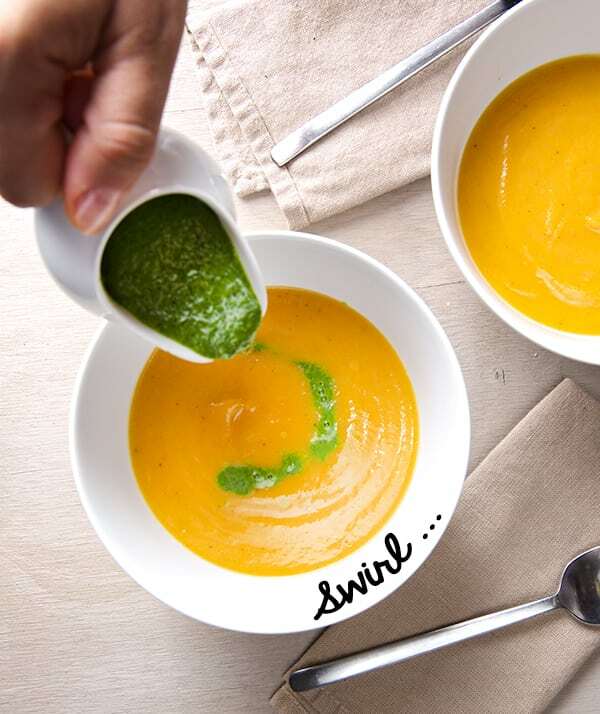 Swirly butternut squash and kale soup ~Yes, more please! Butternut squash is my favorite squash. Autumn has arrived and I could not wait for the cold to make this soup. This nutty winter squash has the creamiest texture and tastes like a delicate pumpkin with mild citrus aroma. 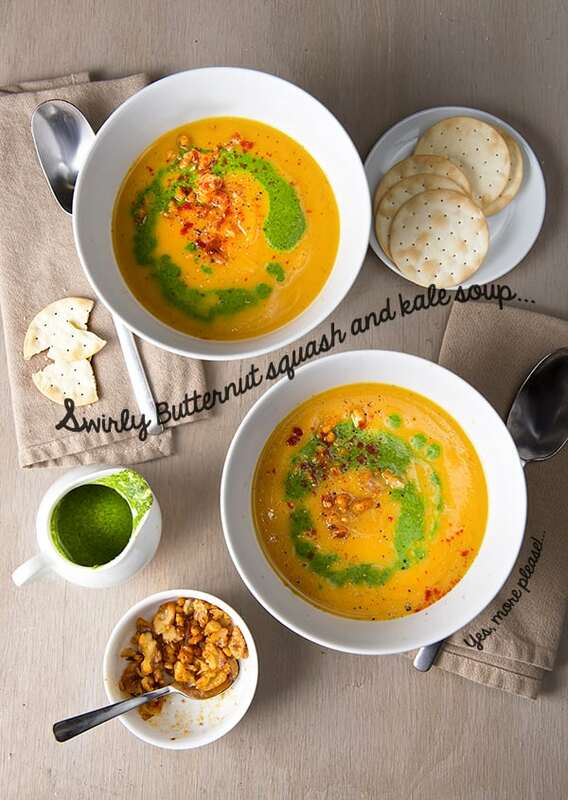 In my opinion Butternut squash makes the velvetiest soup in the world!…..
Now, you know how I feel about vegetable creams or pureed soups. I do not want my squash soup to taste of chicken therefore vegetable stock is my preference. This vegan soup enhances all the pure flavors of the kale and the butternut squash by roasting them and letting those flavors stand out. I roasted the squash and steamed the kale with coconut milk to empower their own flavors. I love the fusion of flavors in soups, but for me there is nothing better that the awareness of the fusion. What do I mean by that? Well these two ingredients are in harmony but they do not mix until you take a spoonful in your mouth then you taste the delicious swirl and contrast in colors, textures, flavors, and even in temperature. The kale and coconut milk add an herbal note without being overwhelming. 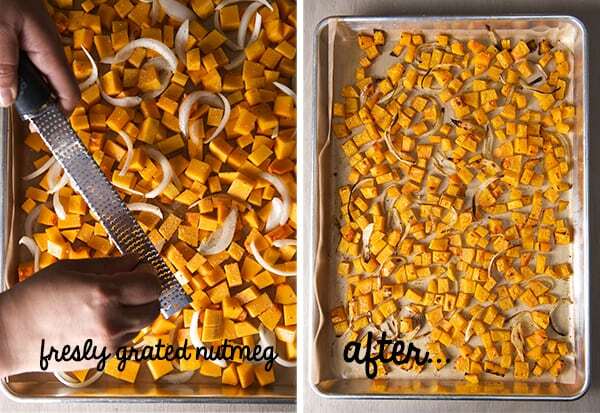 The velvety roasted butternut squash adds sweetness and evokes the Autumn season. 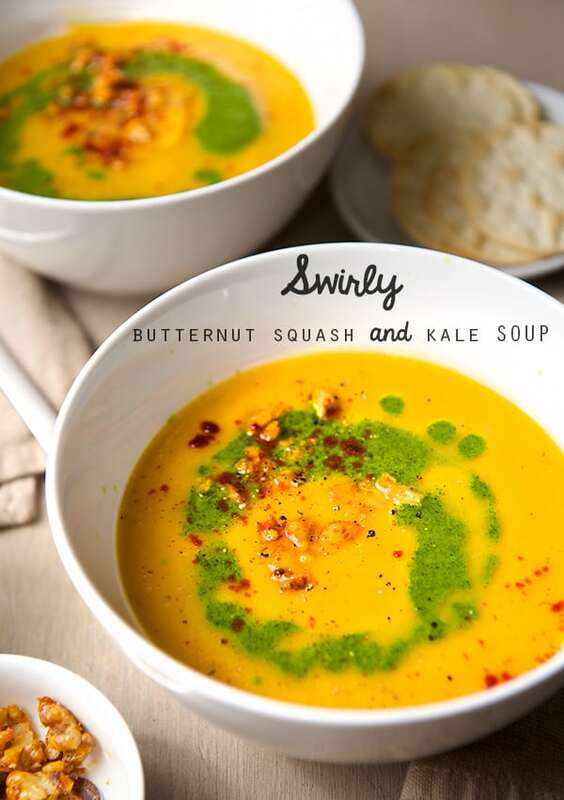 This swirly butternut squash and kale soup is fun to make its easy and it looks appetizingly gorgeous. Whether its lunch with you alone, your friends, or a family get-together this soup is easy to portion and delicious…and it happens to be vegan! Enjoy! Serves 4 bears or 2 mom and pop bears..
Freshly black pepper to taste. 8 Curly-leaf kale leaves deveined. 1. 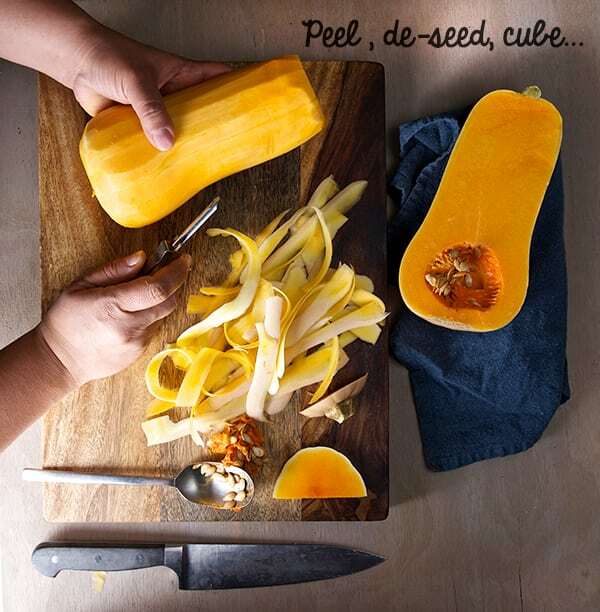 Peel and cut into small cubes the Butternut squash. Slice the onion. 2. On a baking pan lined with aluminum foil or parchment paper, toss the Butternut squash, onions, salt pepper nutmeg and one glug of olive oil all in one layer. Roast in the oven at 425F for about 30-35 minutes, shake the pan every now and then, until the little cubes are fork tender, and toasty. 3. 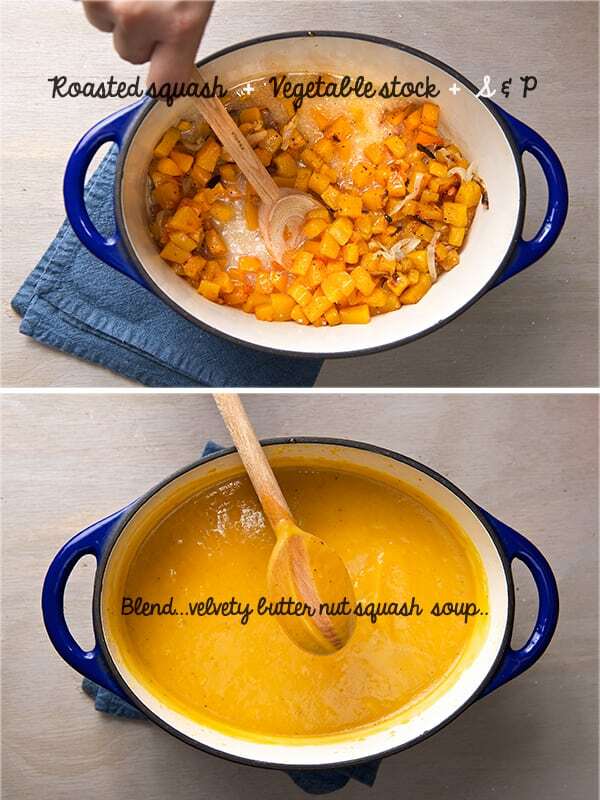 Remove pan from the oven, and in a medium size deep pot, add the roasted butternut squash, add the 4 cups of vegetable stock, salt, nutmeg, pepper, and puree with the help of an immersion blender, or use a regular blender. 4. Check for thickness and if needed add another cup of vegetable stock. This is up to your preference, however I like my soup with a lot of body, and therefore I usually use 4-5 cups. Feel free to add a little more if its too thick or to add some almond milk for an extra nutty flavor. 5. Let your soup warm up on a low low heat, and stir constantly. 6. For the kale swirl: in a small pot place the leafy parts of the kale, discarding the main vein. Add the coconut milk, roughly chopped piece of onion, garlic, salt and pepper. 7. Cover the pot over a slow simmer for about 7-10 minutes until the kale feels soft, and turns bright green. You can taste a little piece to check for doneness, you want it soft and cooked but not over cooked. 8. 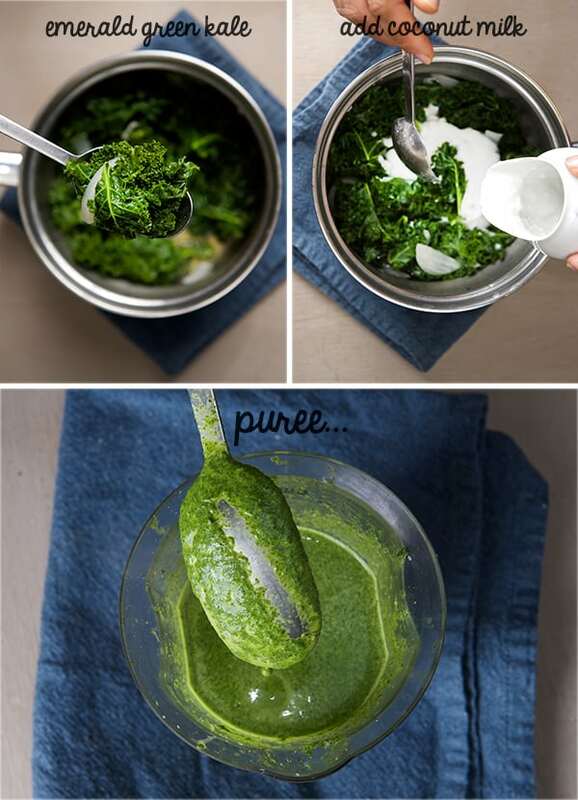 Remove from the stove and using an immersion blender to puree the kale mixture. Adjust seasoning with salt and pepper. The consistency should be creamy and light. It should look like a deep bright emerald green. 9. Roast the walnuts, sprinkle a little smoked paprika and salt. 10. 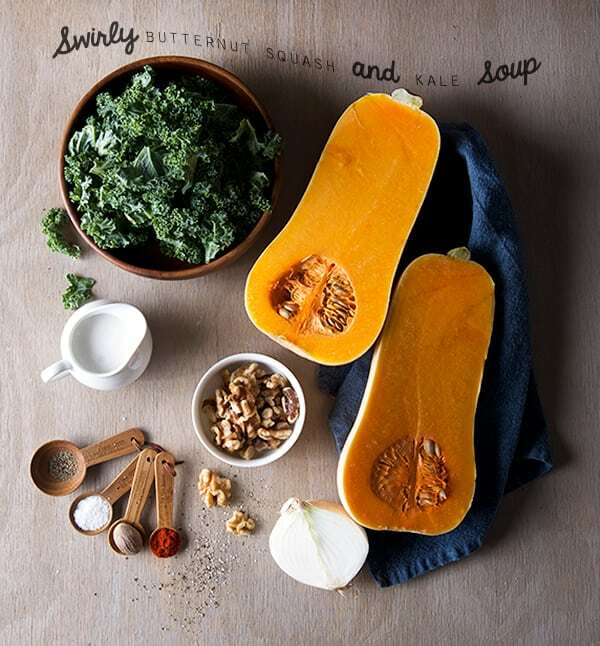 Serve 2-3 ladles of the butternut squash on each bowl and then add the kale swirl. Sprinkle some roasted walnuts, and a pinch of smoked spanish paprika for best flavor. Enjoy! Note: Remaining soup keeps well for 3-4 days and although it diminishes in flavor, extra portions can be frozen and stored for 30 days or so; this minimizes waste if you happen to make too much or have a desire for homemade soup next time you’re too busy to cook.